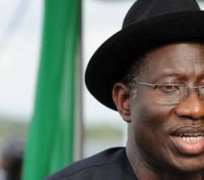 President Goodluck Jonathan has assured Nigerians that his administration would not compromise the restoration of peace and security in all parts of the country. Dr Jonathan, accompanied by the Governor of Delta State, Dr Emmanuel Uduaghan and other prominent Nigerians, gave the assurance Friday (27/02/15)during a courtesy visit to the Asagba of Asaba, HRM Obi (Prof.) Chike Edozien at his palace in Asaba, Delta State. He disclosed that he is seeking re-election because of his commitment towards re-positioning the country positively amongst the comity of nations as well as do more for the country. The President thanked the Asagba of Asaba and other royal fathers for their support for his administration assuring that he would not disappoint them. Earlier, the Governor of Delta State, Dr Uduaghan said President Goodluck Jonathan was delivering on his promises to Nigerians, noting that Delta State was a great beneficiary of the restructuring of the power sector by President Jonathan's administration. He said that the President was in Delta State a few weeks ago for the Presidential Campaign rally of the Peoples Democratic Party (PDP) and as a man who loves Deltans, he was in the state for another official ceremony. 'We are delighted with the good work you are doing, we appreciate you and wish you the best,' the Asagba said.